My current favorite recording rig is based on the SASS quasi-binaural design and gives an excellent listening experience especially when using headphones. I have been playing around with LIGHTWEIGHT designs suitable to carry with me when I’m out walking. 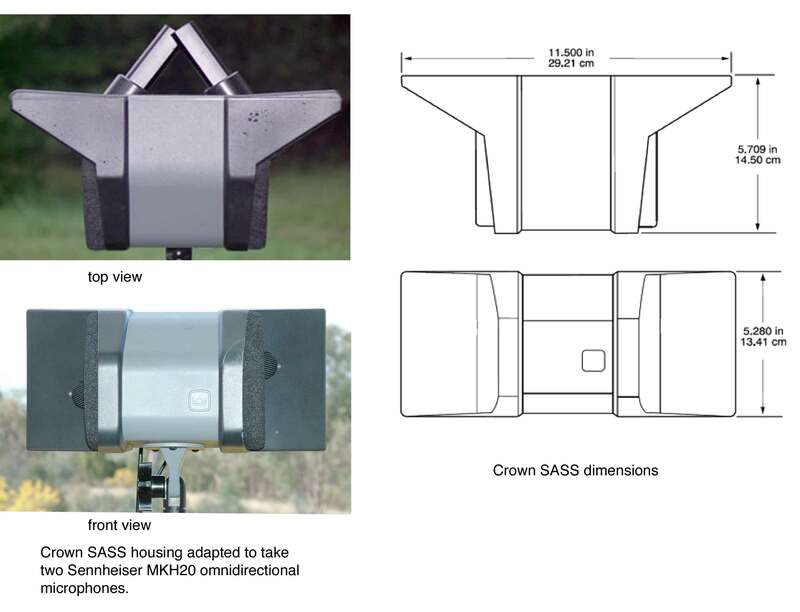 The SASS (Stereo Ambient Sampling System) design was originally patented in 1987 by Michael Billingsley for Crown International Inc. It was intended primarily for recording classical music ensembles and other stereo sound effects. The design was based on the dimensions of a human head so is quasi-binaural in its recording effect, but also claimed to be mono-compatible with its near-co-incident mics, and also speaker compatible (binaural recordings are usually best listened to through headphones). The original Crown mics were less than satisfactory for nature recording (too noisy). Lang Elliott in collaboration with Michael Billingsley was the first person to adapt high quality mics to the SASS design, specifically for nature recording. Walter Knapp popularized this concept by making available his machine-tooled adaptations to the Crown SASS housing to take AT3032 and MKH20 mics. 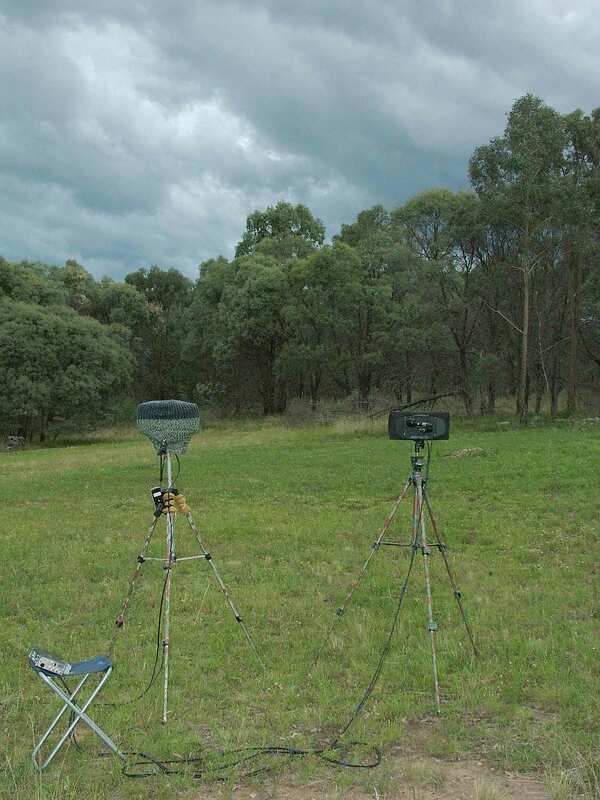 In 2012 the modified SASS rig is still a favourite with a number of professional wildlife sound recordists such as Andrew Skeoch. I don’t think there is anything really sacred about the plastic Crown SASS housing, the SASS effect can be easily copied in other materials, and is also wide open for experimentation. Rob Danielson (professor and teacher at the University of Wisconsin-Milwaukee, USA) designed a mic housing based on the SASS dimensions but made of timber with PVC tubing to hold the mics in place (see pictures below). This design is used by Rob’s students. The wooden design is rather heavy, and even the plastic SASS housing when the pro mics are added, is quite heavy. My own design was adapted to provide a lightweight SASS alternative that can be easily carried on a small tripod in the field. Thus the SASS-Lite Narrow was born! It uses tiny PIP microphones that add very little weight, and the unit connects to my Olympus LS10 recorder. The whole rig is just the thing for carrying with me when looking for opportunistic ambient recording situations. I can set the recorder running, hang it on the tripod, and walk away. These discoveries and designs have been discussed at length on the naturerecordists web group (Yahoo group) and its offshoot the Boundary Mics Group. modified SASS with MKH20s, dimensions from Crown SASS literature. 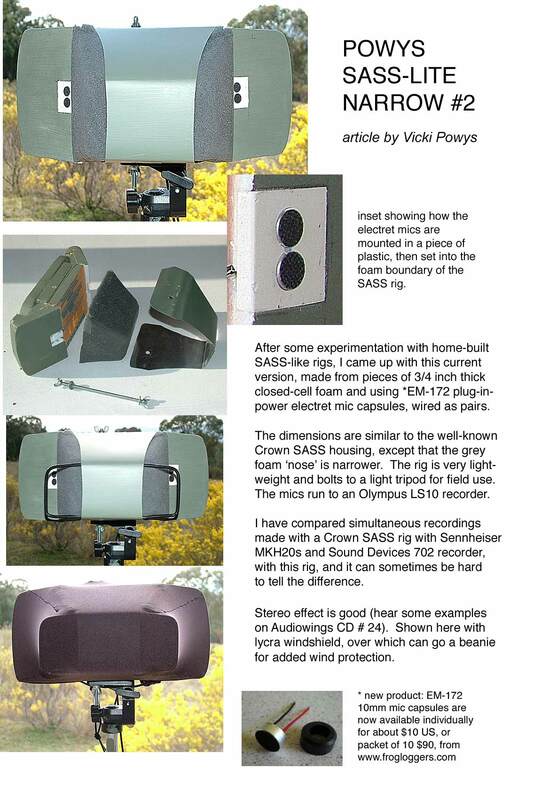 Vicki Powys’ SASS-Lite Narrow, as illustrated in Audiowings, the journal of the Australian Wildlife Sound Recording Group, December 2010. Close up view of my SASS-Lite during construction – the closed cell foam is painted with acrylic paint to help protect it in the field. The grey foam “nose” is open cell foam, designed to allow some sound through, while the closed-cell foam blocks any sound. The metal sheeting over the nose is cut from a sheet of aluminium, helps distribute the sound to left and right, and also acts as a wrapper to hold all the bits together. The microphone elements are flush with the surfaces on left and right hand sides, giving a ‘PZM’ effect i.e. sound is slightly magnified at some frequencies, especially those frequencies at which birdsong occurs. The foam I used was adapted from children’s swim floaties, bought from the supermarket and can be cut with a razor knife and pieces glued together. 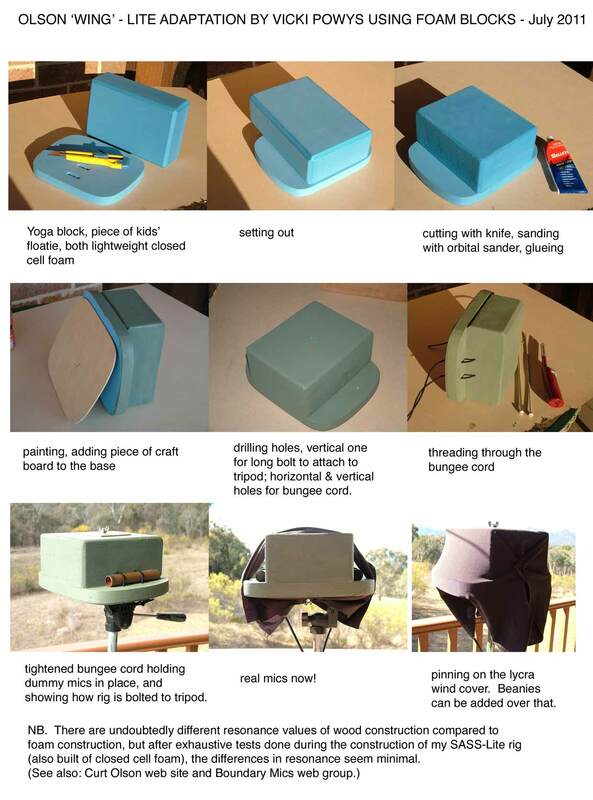 You can also use more dense foam ‘Yoga Blocks’ which can be sawn, drilled and sanded. 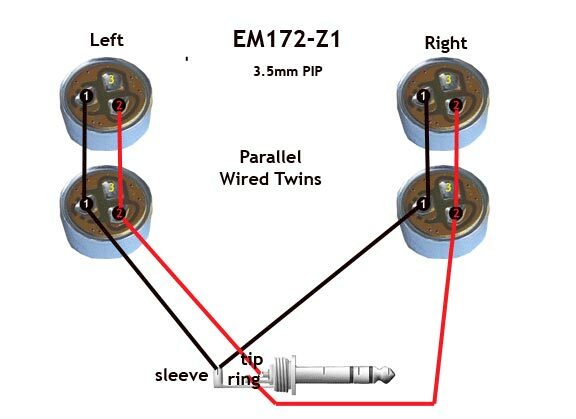 This diagram shows how to wire the capsules ‘in parallel’, which is the recommended way to do it. The shield wire is shown in black, while the sound wire is red. In this following demonstration I have compared two different rigs on their ability to record a thunderstorm. Here is a picture of the two rigs set up side by side. This was 16 December 2010, summer in my part of the world. See if you can pick which is which – HINT – the SASS-Lite is the first recording! I was surprised at how well the SASS Lite and Olympus rig performed in comparison to the more professional (and expensive) rig. AUDIO: a. EM172s in foam SASS to LS10; b. MKH20s in Crown SASS to SD702. Thunder, 2:06 minutes, no filtering or EQ. In August 2011 I built a binaural head out of closed-cell foam, and fitted it with some silicone ears from digdagga.com. [Google ‘silicone ears’ for 2017 suppliers]. Small electret mics were placed inside the ear canals, and run to an Olympus LS10 recorder. I was thinking I might get a more spacious sound with more truly binaural effect, than I had with my SASS-Lite rig. In comparing the binaural head rig alongside my SASS-Lite rig, I was surprised at how much louder the signal was from the binaural head – up to 10 db louder! And this was purely from the mechanical amplification from the ear pinnae. The louder signal only occured for frequencies say 4 – 9 kHz. There was one particular bird (a Weebill) that had a cheery call that goes from 2.5 to 8 kHz and this often sounded uncomfortable, slightly distorted without actually overloading, with the Binaural Head. This sadly was an effect of the uneven response from the Binaural Head. Pro Binaural heads have built in EQ so that you do not have to worry about clipping with higher pitches. My solution was to use some mechanical dampening in the ears, initially a wad of tissue paper in each ear canal, and later a tight wad of polyester fibre. This gave a more realistic rendition of the higher pitched birds. However the uneven and brighter response of the Binaural Head still tended to flatten the perspective somewhat (via headphones), compared to the SASS-Lite. My conclusion is that the sound from the SASS Lite gives a smoother result, and consistently has more depth and is slightly louder or clearer for the bird songs in the lower frequencies. 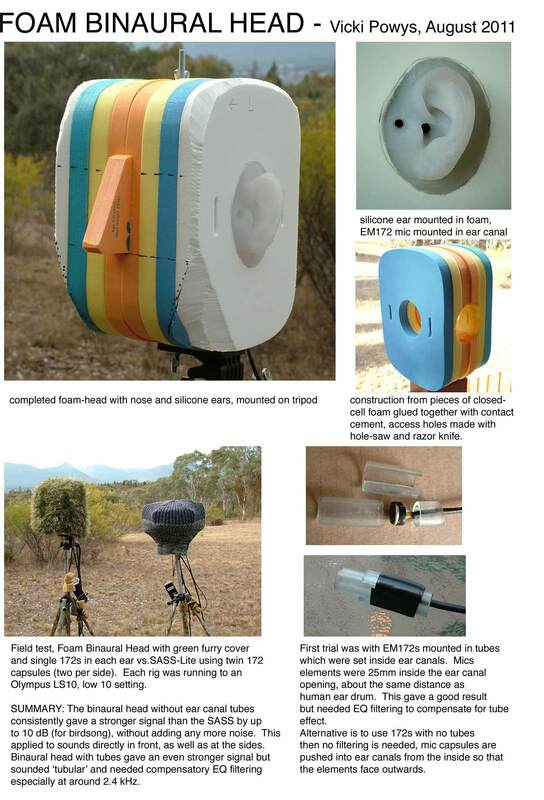 Only in circumstances where I wanted to highlight small twittery birds, and reduce lower frequencies, would I go with the Binaural Head. Otherwise I’m sticking with the SASS Lite, still my favourite lightweight rig! Here is a sample recording comparing SASS-Lite rig with Binaural Head rig (without tubes and without tissue wads). AUDIO: a. EM172s in foam SASS to LS10; b. EM172s in foam binaural head to LS10. Birdsong, 1:03 minutes, no filtering or EQ. I adapted this design to be made with lightweight blocks of closed-cell foam. Here is an early version, I later cut down the height of the main block to 2 inches. The heads of the mics are 2 inches from the front of the rig. Here is a sound sample from the Foam Olson Wing, using MKH8020 mics. AUDIO: MKH8020s in foam Olson Wing to SD702. Birdsong, 2:08 minutes, no filtering or EQ. 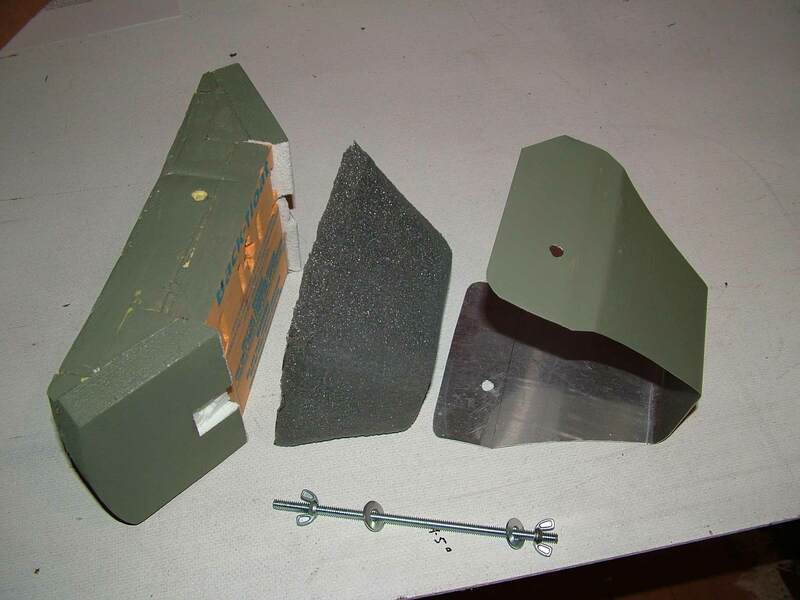 I am currently working on an Angled Foam Wing, designed to give slightly better directional cues than with the parallel-sided Wing (October 27, 2011). For more DIY ideas see pages on recording gear 2, 3 & 4. This page was created in 2011 and upgraded 30 May 2017.